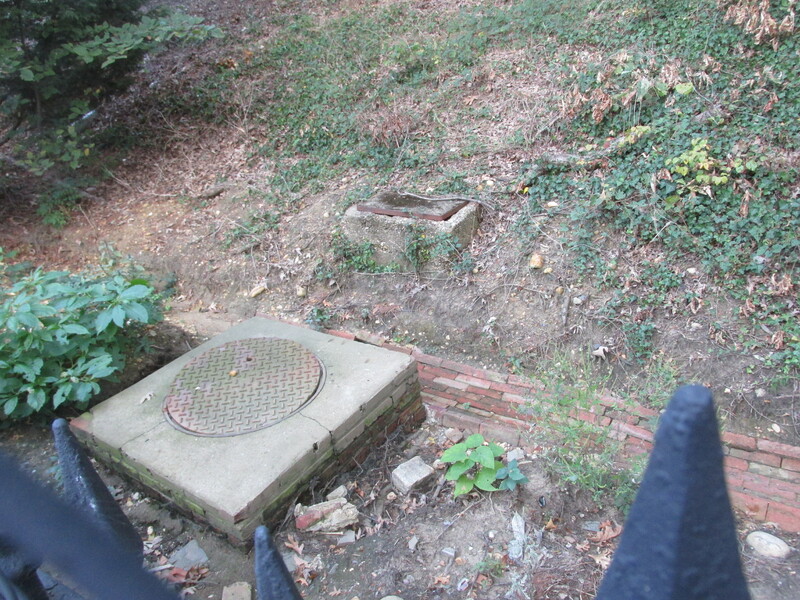 Admiring the Springs that Created Tiber Creek | Park View, D.C.
A little over four years ago, I posted about Tiber Creek and its headwaters rising up on the grounds of the Soldiers’ Home. While Tiber Creek is largely gone to the casual observer, one of the neat things about it is that the Soldiers’ Home’s grounds contain most of the few remaining traces of the Tiber — including the two ponds near the (closed) Park Road Gate, a natural section of the Tiber to the south of the ponds, and a brick lined channel just inside the fence along Rock Creek Church Road between the Randolph and Eagle gates. Brick and concrete structure at the northern end of Tiber Creek. Recently, while walking along the fence and looking at the brick channel, I noticed that there are some brick and concrete structures along the channel. The northern one is just south of Upshur Street, the southern most one is located near Shepherd Street, and there is one midway between the two. There are also a few small clay pipes that go into the hillside along the channel. While the channel is mostly dry now, several weeks ago it had a trickle of water and these structures appeared to be the sources of the water. The structures appear to be built over the springs that create the Tiber, and which gurgle from the earth with varying activity depending upon the wetness of the season and ground water level. The photograph below shows the structure closest to Shepherd Street. Even in its current dry state, it is still damp with a small pool of water. (A small spring helping to feed and create what remains of Tiber Creek. This one is located near Shepherd Street). This entry was posted on October 1, 2015 at 7:01 am and is filed under History. You can subscribe via RSS 2.0 feed to this post's comments. Timely mention, since these trace pools may become rushing creek through the brick sluices during this sustained rain we are/will be having. Might take a look myself. I wonder what Carolinegarnold’s coworker’s step-aunt is up to these days…..
Wangari Gardens would love some of that water, seeing as how their is no current water source for the public or private gardens. There’s a pretty healthy spring that keeps the sidewalk along the fence consistently wet during much of the spring and fall right at where Shepherd Street hits Rock Creek Church Road. I’ve always thought that the structures you reference here are simply old storm water pipes, but your observation that they are always wet combined with the sites history makes it more clear that its probably ground water. Very interesting. 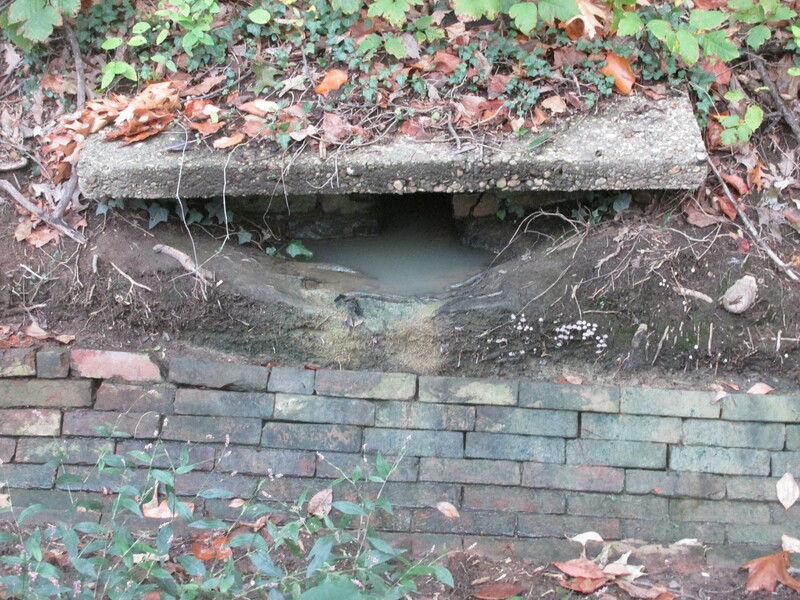 It’s also neat to observe that the brick channel runs under the old Randolph Street guardhouse! When I moved in, that brick channel was buried in dirt and debris until I mentioned its existence to David Watkins! Not long thereafter, a crew of workers spent a couple months clearing it out! 0=15Look here,,,,!my co-worker’s step-aunt makes $79 an hour on the computer. She has been out of a job for 9 months but last month her pay was $17477 just working on the computer for a few hours. I imagine that there are/were other springs on the eastern side of the Soldiers home. I am certainly happy that this place exists as otherwise the remnants of Tiber Creek would be long gone or in much worse shape at least. Just the same I would love to be able to actually go over there and explore what is left without having to look through a fence at all. Who knows? With the budgeting issue they are having over there it may indeed become a park that people can pay a modest admission to go to.